New to this series? Click here to start at the beginning! 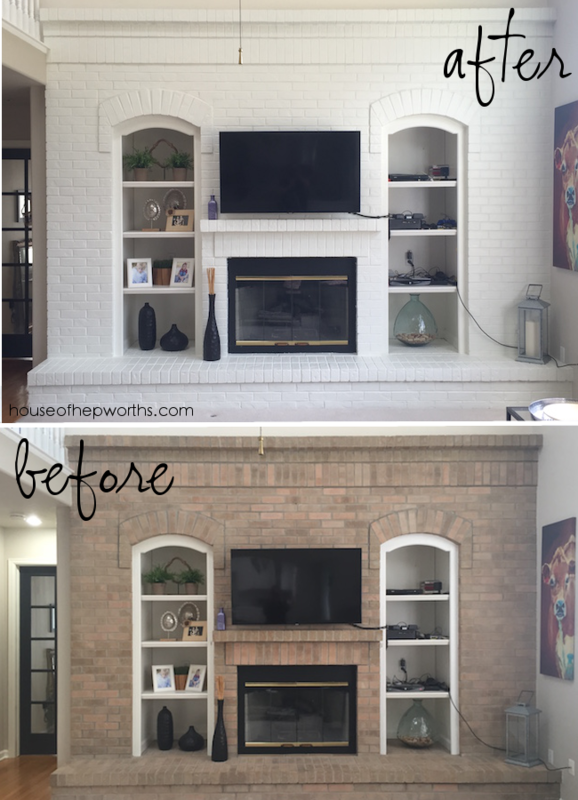 As part of our whole house renovation we decided to update the brick fireplace wall. We want something a little more modern. When we moved in I painted the brick white to give it a more updated look, but I always knew that some day I’d knock the whole wall out and start over. 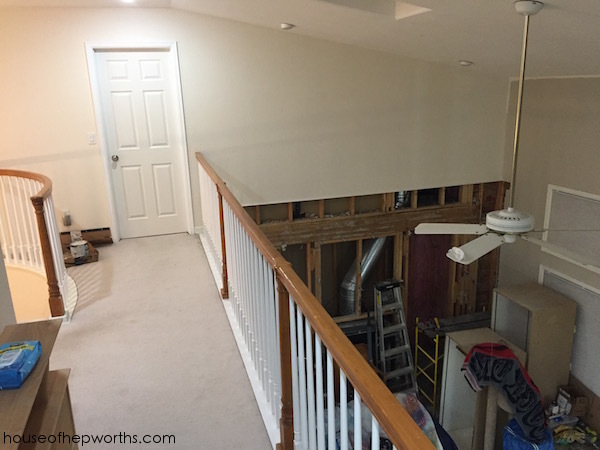 I really liked the updated white look as opposed to the peach brick, but knowing we are about to install new hardwood floors, now is the perfect time to demo the wall. 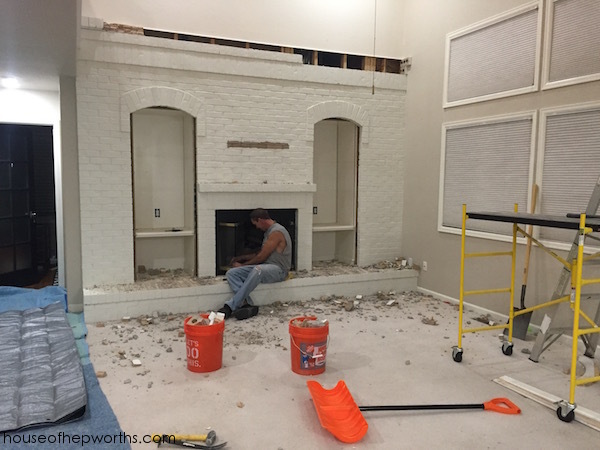 We left the carpet in place while we demo’d to help cushion the bricks as they fell. 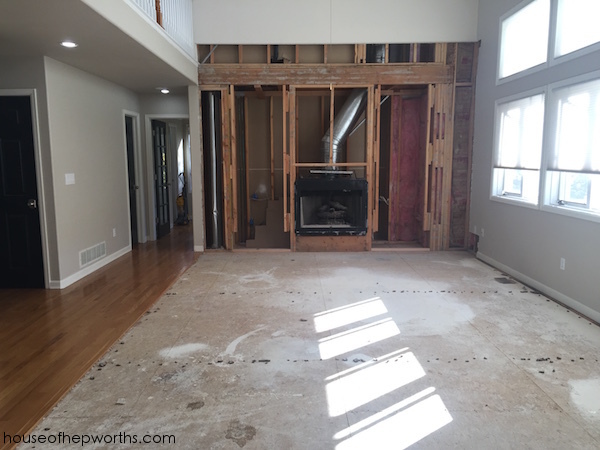 We also covered the existing hardwood floors (on the left of the fireplace) with packing blankets and tarps to help protect them from getting severely damaged. 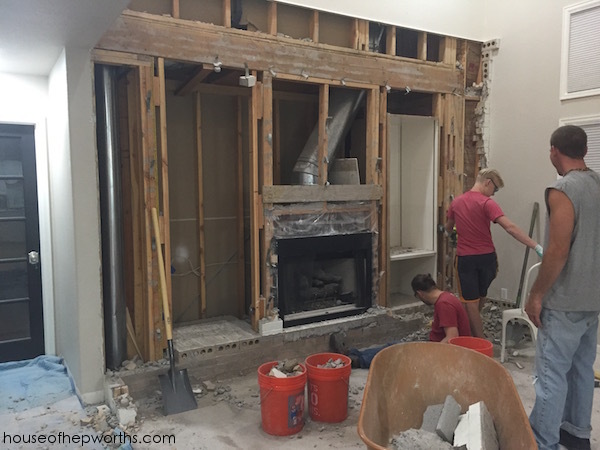 A friend came over to help with the demo of the brick. It was a long night! Of all the construction we’ve done, this was by far the messiest. 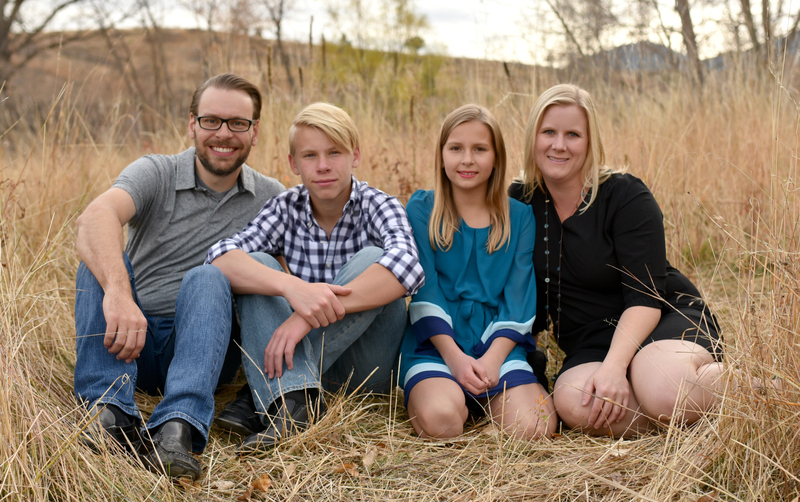 A thick cloud of dust filled the air and made it hard to see. I didn’t take many pictures during the process because the dust was so thick in the air. We rented a huge wheel-off dumpster and dumped all the brick in there. We made at least 40 trips, if not more, back and forth with the heavy brick. One thing that was very surprising was when we finally started demoing the heart. Instead of the hearth being solid brick, it was hollow and FULL of sand. Completely full of sand. Buckets and buckets of sand, mixed with some trash and leftover pieces of brick. We spent more time shoveling sand than actually tearing out brick. Here you can see how the fireplace wall looks from the 2nd story catwalk. Here’s how the wall looks with no brick. Now we can finally start working on the floors. And here’s a wide view from the kitchen (without the half wall!) 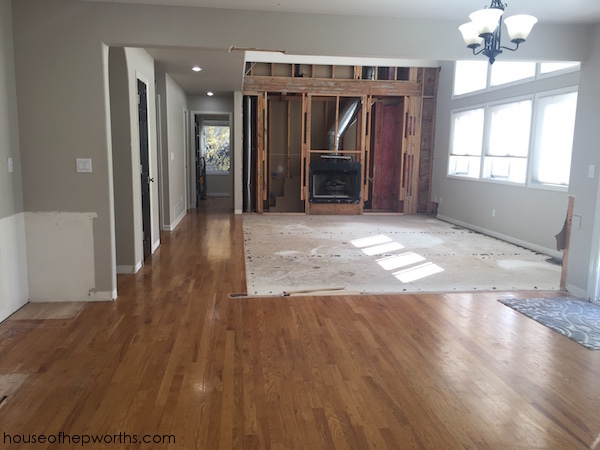 Our house is almost ready to start on the new floors! 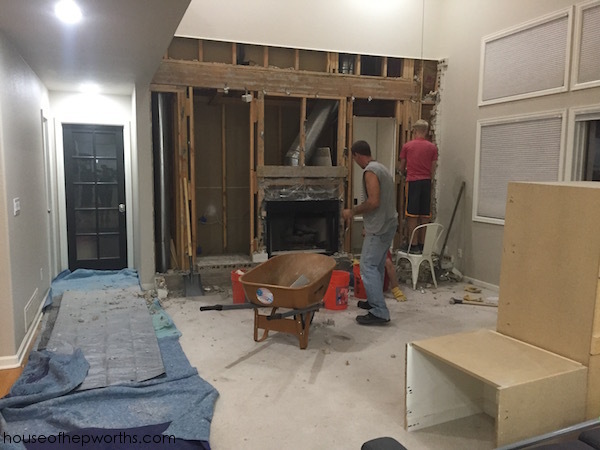 There’s one more big project we have to work on before we can do the floors – build a wall and door opening into the formal living room. I’ll share this process in the next post. I saved it for last because it is the most complicated of all the projects. Check back Wednesday for that post!